You can browse tickets here, and after pressing "Add to Cart", you will be at Brown Paper Tickets for final selection and payment. Select the 2:00PM or 7:00PM show at the left before selecting seating section. You will not have paid or reserved tickets until after entering all the required Charge/Debit Card information and submitting by pressing "Complete Order". 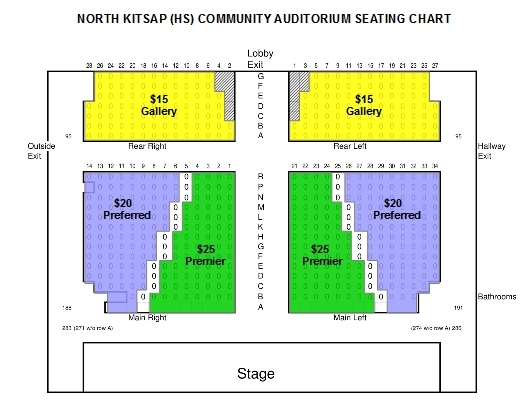 It is open seating within each section, no assigned seating for these shows. Please arrive early to pick out your best seat in the section of your purchased ticket. Lobby opens for Will Call at least 60 minutes before, theater seating 30 minutes before start of show. You can also call 360-337-7464 for tickets. Your call may be forwarded to a Brown Paper Tickets agent. They are very nice, but if you want very specific information or want to talk to a Chordsmen member, you may have to call back later.